NXP Semiconductors have today announced the industry's first transistors in a 1.1-mm x 1-mm x 0.37-mm low-profile DFN package. Consisting of 25 types, the new portfolio includes low RDSon MOSFETs, low saturation transistors and general purpose transistors that boost current capabilities up to 3.2 A. Ideal for power management and load switches in portable and space-constrained applications, the new transistors feature ultra-small form factor and high performance. The new product series is available in two package versions. Offering a power dissipation capability of 1 W, the single-die DFN1010D-3 (SOT1215) package comes with the special feature of tin-plated, solderable side pads. Meeting strict automotive requirements, these side pads offer the advantage of optical soldering inspection, as well as a better quality of solder connection compared to conventional leadless packages. With a 1.1-mm² footprint, the dual-die package DFN1010B-6 (SOT1216) is the smallest package available for dual transistors. Delivering equivalent or even better performance, the products in DFN1010 can replace many WL-CSP devices, as well as larger DFN and standard leaded SMD packages such as SOT23 which is eight times the size. The single and dual MOSFETs (N-ch/P-ch) feature low RDSon values down to 34mOhm, ID up to 3.2 A, voltage range of 12 V to 80 V and ESD protection of 1 kV. The single low VCEsat (BISS) transistors feature low VCEsat values down to 70 mV, collector current up to 2 A, peak collector current up to 3 A, VCEO of 30 V and 60 V and AEC-Q101 qualification. Dual NPN/PNP resistor-equipped (digital) transistor and single and dual general purpose transistors are also included in the new NXP transistor portfolio. 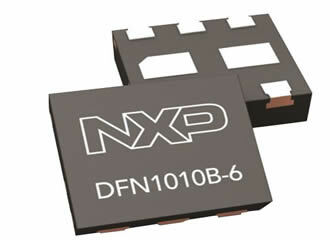 The new transistors in DFN1010 are available immediately in high-volume production.